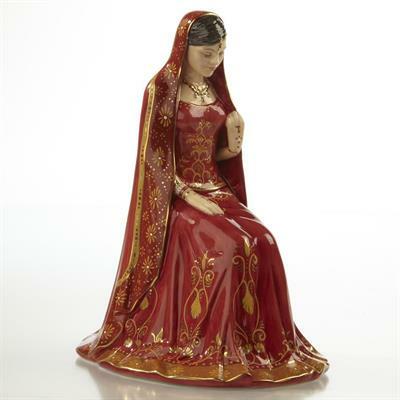 Eternal Love is pledged on a wedding day and this striking demure figurine perfectly captures the rich emotion of the occasion. Eternal Love is dressed in a typical Indian wedding dress. The deep red costume combines silk, satin and net materials and is sumptuously decorated with golden embroidered motifs. Following ancient custom the back of the bride's hand is decorated with henna using motifs and symbols traditionally passed down in families for many generations.